Day Away participant Sheila Adams draws the winning raffle ticket assisted by Program Administrator Fran Olson as volunteers look on with the winning quilt. Volunteers of Day Away spent many hours over the summer selling raffle tickets for a beautiful handmade quilt made with love by volunteer and Steering Committee member Nel Garden. 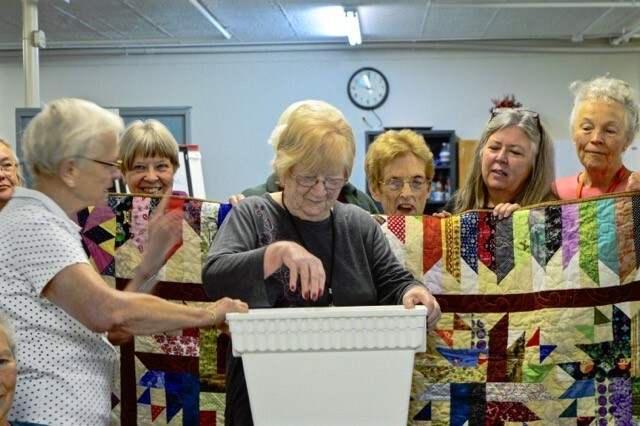 The lucky winner of the quilt was Monica Hart of MA who has owned property on Newfound Lake for 47 years and spends much of the summer and fall at the lake. Thanks to all who purchased tickets. More than $2,000 was raised to assist with the programs needs and to assist a participant with their modest weekly fee. Congratulations Monica! !